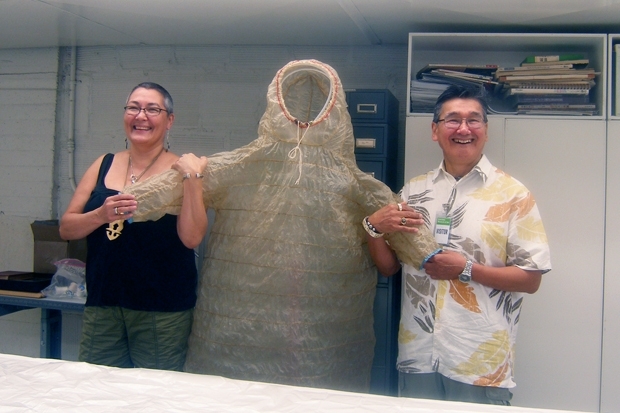 On view in the textile exhibition Sheer Delight was a Yu’pik parka made of seal gut (hopefully you saw it!). The parka was on loan from Yu’pik master storyteller, dancer, and all-around culture bearer extraordinaire Chuna Mcintyre, who is originally from Alaska—the coastal village of Iik on the Bering Sea, to be precise. The exhibition closed in February and last month the museum had the honor of having Chuna come to pack his parka to send it to his current home in California. Chuna’s imarnin dates to the 1930s or 1940s. It is translucent, which means the gut was dried in the summer, and is made to withstand water. A seal-gut parka that is dried in the winter is opaque, and is made to withstand wind. “Few people today have the time or make the effort to get the gut to this point,” he explained. “The skill required is tremendous, as with anything that is important.” Though it looks fragile, the garment is durable, and according to Chuna people who have worn them on the tundra say it is amazingly warm. Chuna begins to spritz the parka with water to soften it. To be able to fold the stiff parka, Chuna lightly and evenly spritzed it with water, and the structure appeared to deflate as it softened. He methodically did several rounds of spritzing, until the entire parka was pliable enough to be folded until it fit neatly into a FedEx box. Collections manager Brady Evans recorded the entire process as an instructional video for staff. Chuna explained parka details to museum staff. Yes, the parka fit comfortably in the FedEx box. But the museum won’t be seal-gut-parkaless for long—it has just purchased its own imarnin, a winter version, from the late 19th century. It will arrive soon from the Brant Mackley Gallery. And Sara already knows how to care for it, thanks to Chuna. The museum’s Aleutian seal-gut parka. I pick, you pick, we all pick Yu’pik!